IIM Shillong fraternity paid homage to the missile man, Bharat Ratna Dr. APJ Abdul Kalam, on his birth anniversary on 15th of October at the IIM Shillong campus. A Scientific Seminar on ‘Science and Humanism for National Development’ was organised, in keeping with his contribution to science and his objective of social development. The seminar saw eminent speakers such as Dr. W Selvamurthy, Former Distinguished Scientist and Chief Controller, DRDO, Swami Atmapriyanandaji Maharaj, Dr. Tapan Misra, Director, Space Application Centre, ISRO, Ahmedabad and Dr. R A Mashelkar, National Research Professor and CSIR Bhatnagar. The seminar was conducted in the same auditorium wherein the former President gave lectures to the students. Dr. Kalam‘s initiative PURA (Providing Urban Amenities to Rural Areas) was discussed. He believed that all technology is useless if it is not simple and does not help to solve a man’s real life problems. It was said that Dr. Kalam was a person who built many extraordinary organisations with ordinary people, through his inspirational leadership. His extraordinary leadership skills were attributed to his humility, purity of heart and his ability to connect with every individual at every level. To live up to the legacy the institute decided to establish a 2000 sq. ft. auditorium with the capacity to seat 800 students in the name of Dr. Kalam along with a bust of Dr. Kalam in front of the auditorium. A ‘Bharat Ratna Dr. APJ Abdul Kalam centre for Policy Research’ is to be founded in keeping with his objective of societal development. Dr. Kalam believed that teaching is a step and not an end An initiative ‘Nurturing Minds’, beginning on the 17th October is to be undertaken by the students, to teach Mathematics to school students starting from class VIII. In the initial phase, classes of two-hour duration are to be conducted every Saturday for selected students nominated by local schools. An annual function is to be organized every year to honour the memory of Dr. Kalam, who delivered his last lecture in IIM Shillong, hours before his untimely demise. 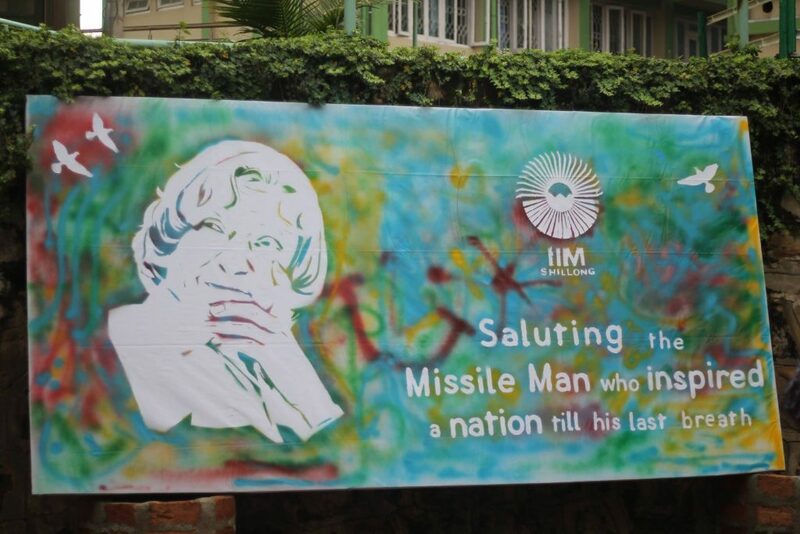 Finally, the IIM Shillong student fraternity undertook an initiative in which the students and faculty were involved in spray painting a large canvas, to reveal a sketch of Dr. APJ Abdul Kalam underneath. This activity was conducted to salute the ‘Missile Man’ who inspired a nation till his last breath (The video link to the activity can be found below).